Our dedicated studio space has inspirational views across the London landscape. LSBU maintains dedicated studio spaces and specialised equipment for architecture students. From expansive, bespoke working space for both undergraduate and postgraduate architecture students to sophisticated hardware supporting advanced digital design and fabrication, LSBU is helping to transform the architecture industry through students’ creative use of its facilities. Architecture students’ dedicated studio space is near the top of the Keyworth Building. Meanwhile, architectural centres at LSBU act as a hub for innovation, networking among practice experts and the general promotion of adopting BIM principles, advanced computational design, structural and spatial simulations, and robotic fabrication. 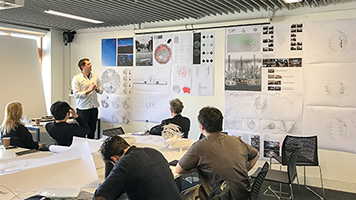 Dedicated studio spaces with inspirational views across the London landscape are used to develop students' skills and train the next generation of architects. The studios are used for individual tutorials, workshops, formal hand-drawing classes for first year students, seminars, and interim and final design juries, where students formally present their work to a panel of visiting guest critics drawn from all sectors of architecture and the fine arts. 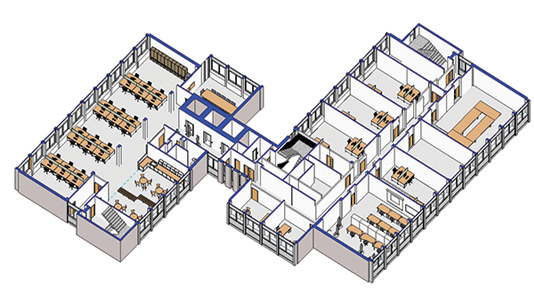 BIM is a collaborative approach across the whole design team to managing and planning every aspect of design and operation in the construction process in a more efficient way to improve the basis upon which industry professionals and their clients operate. The BIM Centre at LSBU acts as a hub for innovation, and professional training and networking amongst practice experts in the built environmental sector. This advanced digital manufacturing robotic lab is designed for high quality design, research, and fabrication as well as developing commercial applications for architecture. This is achieved by using an industrial robotic arm in combination with quick change plates, which are able to easily modify the configuration of cells depending on the process to be applied. LSBU is one of the few schools of architecture offering these facilities, which represent a unique opportunity for students to undertand and test the connections between digital design, fabrication prototyping, and large scale manufacture.